Easy Zucchini Glazed Spaghetti, a truly brilliant medley utilizing one of summer’s favorite squashes. A simple combo of zucchini and spaghetti, partially cooked in zucchini water delivering a wonderfully lustrous, easy and utterly delicious meal! This is one beautiful pasta and vegetable dish that truly delights! Its both pleasing to the eye with shreds of vibrant green flecks of the delicate zucchini squash. This pasta dish screams summer in the sun! Not much of the zucchini goes to waste when preparing this meal and its virtually fuss free! Which means less time in the kitchen. Aren’t you loving it already? Actually the most effort required when preparing this meal is in grating the zucchini. You may want to be careful with your box grater though…just saying! After grating the zucchini, its placed in a colander with a few flavorful add ins and set aside for an hour. This allows the zucchini to release all its delicious juices. But we’re not throwing out the green juice. The juice is then used to finish cooking the pasta which yields a lovely glossy sauce. 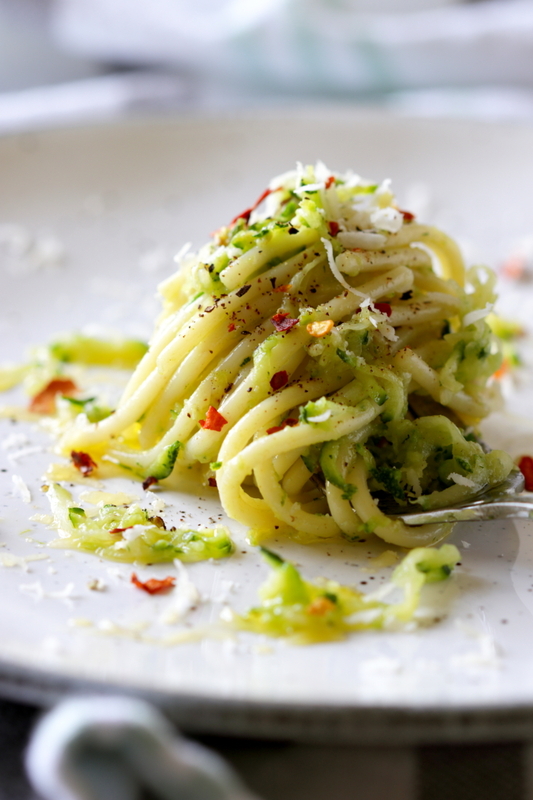 The raw shreds of zucchini are then tossed with the pasta to complete the dish. 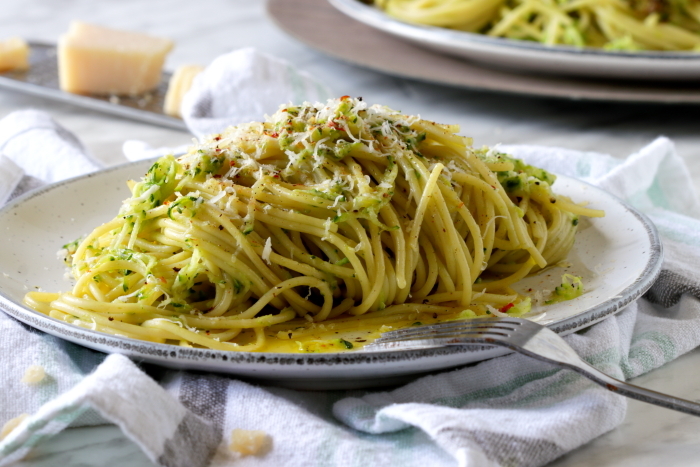 Then, all that’s needed is a generous drizzle of extra virgin olive oil and freshly grated Parmesan cheese. Oh…and some cracked black pepper and red chili flakes which certainly elevates the pasta to brilliant status! You can fry some of the grated zucchini with a little olive oil and use it as a garnish if your so inclined. Its totally optional but does add a little contrast in texture. With a few simple ingredients your palate is never overwhelmed. Enjoy! 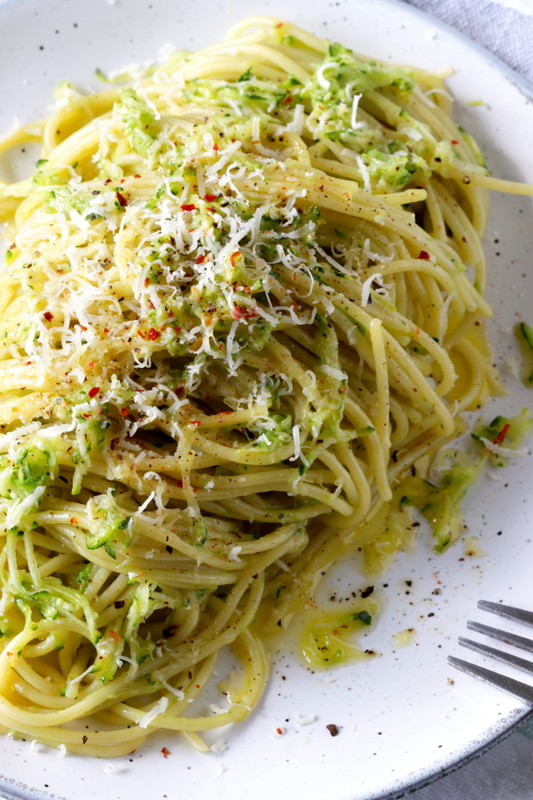 A brilliant medley of freshly grated zucchini, zucchini water and spaghetti is transformed into a luscious pasta dish that is simply perfect for any day of the week. Start off by lining a colander with a cheese cloth and then place it in a large bowl. If you don't have a cheese cloth, a very fine meshed colander will work just as well. Finely grate the zucchini on the smallest or second smallest holes of a cheese grater. Toss the grated zucchini with the garlic, salt, freshly ground pepper and chili flakes. Place the zucchini mixture in the lined colander and set aside for 1 hour at room temperature. As the zucchini sits in the colander it will slowly release its juices. Squeeze out the zucchini to release its remaining juices and set both the liquids and the squeezed zucchini aside while you cook the pasta. Cook the spaghetti in salted water for half the time indicated on the package. Use the empty pasta pot to bring the zucchini juices to a boil. Add in the spaghetti while stirring occasionally just until the spaghetti is al dente. The pasta will absorb the juices as it finishes cooking while absorbing all its wonderful flavors. 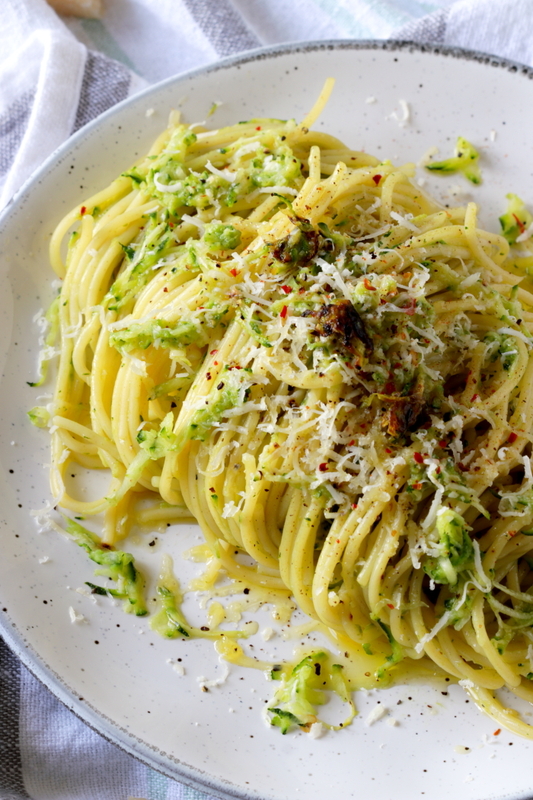 When ready toss the pasta with the grated zucchini, a generous drizzle of extra virgin olive oil and the Parmesan cheese. This recipe was adapted from Francine Segan's "Pasta Modern" cookbook with a few switch ups. I've increased the amount of garlic for personal taste and spiced up the dish with some hot chili flakes and freshly cracked peppercorns. As with most simple dishes with few ingredients, do use a good quality extra virgin olive oil to top the pasta! Oh my this looks good! I love how nothing goes to waste! Yes it’s a brilliant concept and I love it as well and super easy to put together! Thanks Mimi! Lovely pasta ! I like the idea of infusing pasta in concentrated vegetable juice, thanks for the inspiration. It’s definitely a wonderful way to flavour the pasta! So simple and delicious! Thanks Megala! I would love to try this with a wheat & gluten free pasta. Sounds so delish! Corinna I’m sure it will be fabulous with wheat and gluten free pasta! It’s so simple and yet so flavourful! Thanks so much! Oh wow! At first I thought this was going to be one of those zucchini noodle recipes – but truly this is waaay better. Honestly, today I just got my first batch of free zucchini from a local farmer – one can only make so much zucchini bread. This recipe will come in handy!! Thx so much! I’ve never had a zucchini only noodle dish. I could never give up my pasta…life is simply too short? The zucchini here really bulks up the pasta and makes a satisfying meal and if you still have lots more zucchini, I would definitely make zucchini bread for dessert? thanks Diane! I’ve made zucchini noodles, but never thought to use the zucchini in a glaze for regular noodles. Brilliant! And looks deliciously filling! It’s a wonderful veggie and carb combo and yes quite filling! It’s a perfect meal with a side salad! Thanks Leanne! So institutive Marisa, saving the zucchini water is brilliant! I love the way this sounds, especially on those dog days of summer. My apologies for late reply, I somehow missed your comment:( This pasta dish could not be easier and yes especially wonderful on these hot and humid days! There’s no skimping on flavors here! Thanks so much Bella! I love your pasta dish. It so much suits my taste buds coz I hate making pasta with a tomato or a white cheesy sauce which are quite heavy. I like something light and flavourful as yours and with the addition of grated zucchini it is a much healthier option. 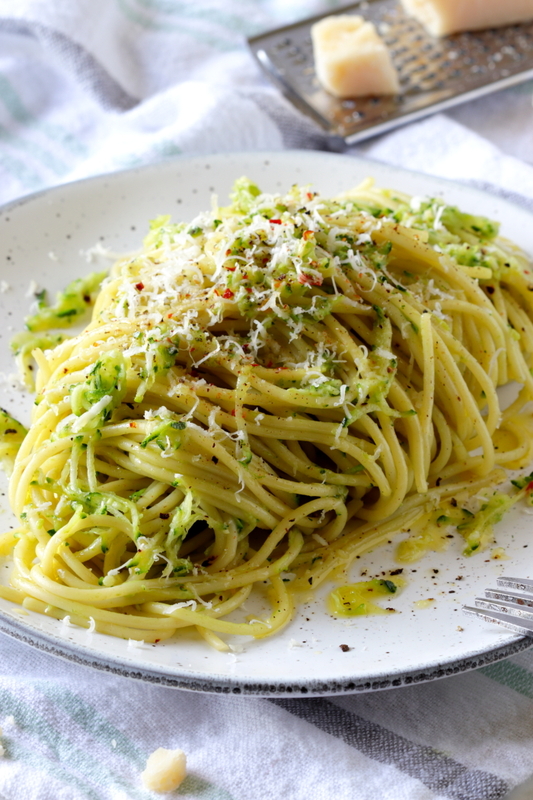 It is a good idea to add grated zucchini as it blends in with the spaghetti and its flavours. Very appealing to the taste buds, great pasta dish. Thanks for sharing. This combo of pasta and zucchini certainly fits the bill of light and flavorful and one pasta dish that you can turn to for a quick and satisfying meal. Hope you get to try it Fouzia and thanks so much for dropping by!